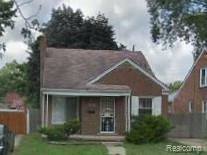 Excellent investment opportunity on a brick home located in a prime area on Detroit's West Side. Three bedroom bungalow located near W. McNichols and Greenfield. Second bathroom in basement. One car detached garage. Tenant occupied at $830/month (Section 8). No showings until accepted offer. TENANTS ARE UNAWARE OF SALE - PLEASE DO NOT APPROACH.